This 1930 Plymouth is a rare classic car that was made during the Prohibition era. Today the company sometimes uses this car to delivery product to stores. Don’t worry though – the bullet holes on the door are just stickers! The Hocking Hills region has long been known for its moonshine. Once illegally produced in the hills by bootleggers, now the infamous drink is being made legally in the heart of Logan. Hocking Hills Moonshine is a relatively young company that uses old time techniques to make a timeless drink. “If you think Moonshine is supposed to taste bad and burn all the way down, you’ve never had good moonshine,” exclaimed Brian St. Clair, who co-owns the business with his brother Eric and cousin Ray. Brian St. Clair explained the recipe and the manufacturing process while he stirred. Brian gave VCNB a tour of the distillery and retail store in Logan, providing a combination history lesson and chemistry class. He demonstrated how their award winning moonshine is made, starting with a recipe of cracked corn, sugar, yeast, syrup and fresh water from the family farm. It’s the water and the small batch production that give their product the sweet, smooth flavor that has made it increasingly popular. Brian indicated that it’s the local water that helped the nearby town New Straitsville claim the title Moonshine Capital of the World back during the Prohibition years. Brian actually got to meet and learn from some of the old timers who perfected the craft when he started out as a volunteer at the New Straitsville Moonshine Festival in the eighties. “The Moonshine Festival Committee needed volunteers. The festival had a permit to make moonshine whiskey for display purposes only and they needed help,” Brian explained. “I learned from Prohibition era old timers who did it for years,” he said, explaining that until 2010, it was illegal to produce Moonshine in Ohio. In 2015, Brian, Eric and Ray opened their business and have worked constantly to improve their product and grow the business. Today, their bestseller is 120 proof Buckeye Lightening. They also offer 45 Proof Granny Apple, 45 Proof Blackberry, 45 Proof Peach and 90 Proof. Efforts are underway to offer additional flavors. Ohio law limits sales to state liquor stores in Ohio and their products are currently available in over 200 stores across the state. Their product can also be purchased in their store. When you visit, allow a little extra time to take a free tour of the facility and to look around. Both the tour and store are family friendly. Speaking of family, the business is a family run affair with help from Ray’s mom Cheryl as well as Brian and Eric’s sister Tammy. In addition to moonshine, the store sells locally made items and has a number of antiques on display. The store features some locally made items as well as Hocking Hills Moonshine shirts and other merchandise. They also have a load of interesting antiques to look at and photograph. One wall is actually constructed of wood siding and a door from a nineteenth century grain bin from the family farm. Brian said that he, Eric and Ray used it as a club house when they were kids and that it seemed appropriate to incorporate into the décor. They even have a backdrop, complete with antiques, that is perfect for group pictures. An old pot, antique farm implements, milk cans and even a coal miner’s bucket are among the unique items on display. Visitors can also see the awards they brought home from the Denver Spirits International Competition. Over three hundred competitors were judged and their Buckeye Lightening took the Bronze Medal while their 90 Proof brought home the Silver. Earlier this month, the business was recognized as the Hocking Hills Chamber of Commerce’s New Business of the Year. If you can’t make it in to their Logan location, look for them at some events in 2017 including a bike rally in Ironton and the Sam Jam bluegrass festival in Pike County. Follow them on Facebook to learn about new products and to keep up with new locations where their moonshine is sold. Hocking Hills Moonshine is located at 519 E Front Street in Logan. Call them at 740. 603.4483 or check out their website. Earlier this year we told you about a pet project of the staff at our Hocking Hills Banking Center. After realizing the ever growing need of the Hocking County Humane Society, the staff wanted to help. First they went shopping on the bank’s behalf and donated a carload of food, litter and other supplies. Then they put out a donation container and a list of items needed and watched the donations begin to come in. The Humane Society rescues abused and neglected animals, helping animals big and small, including dogs, cats, horses, bunnies, goats and other creatures that need a safe place. The shelter is run by volunteers and operates on a shoestring budget. Hocking Hills Banking Center employees Grace Delong and Julie Romine are avid supporters of the Hocking County Humane Society. They are pictured with the donation bin inside the bank lobby. Donations of cash or items are welcome. Branch Manager Autumn Warthman said it all began because some of her employees volunteer with the Humane Society and they had remarked on the tremendous need the organization faces every day. With their shelter at capacity and resources stretched thin, the office staff wanted to do more. So the staff put out a collection box for cash and change, as well as a list of items needed and a place to put them. Donations immediately began rolling in. So far, they have delivered items at least four times and have collected almost $400 in monetary donations. Warthman believes bank customers appreciate the opportunity to help less fortunate animals in the community. “A lot of them are pet friendly and they are loving that they can help this way. I’ve been shocked and grateful for the generosity so many people have shown,” she explained. She said a story in the Logan Daily also gained the project a lot attention, encouraging not just HHBC customers but all of the community to give. Needed items include everything from food and cleaning supplies to old towels and newspapers. See below for a complete list of requested items. Warthman said there is an ongoing need for money, supplies and volunteers and that the office will continue accepting donations indefinitely. Follow the Humane Society on Facebook and click here to read our first story on this project. Hocking Hills Banking Center Manager Autumn Warthman poses with some items the bank recently donated to the Hocking County Humane Society. Last month we asked VCNB employees to submit pictures of their pets to be posted on our Facebook page for Love Your Pet Day. We learned that many of our employees are devoted pet parents who love to talk pets. 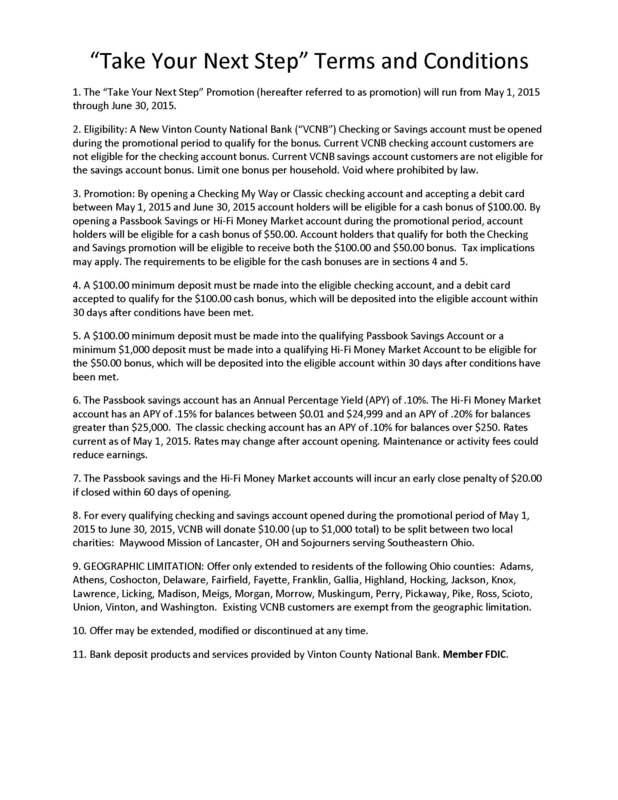 That started a conversation at our Hocking Hills Banking Center about an organization in Hocking County that could use a helping hand and we decided to get involved. The Humane Society accepts only abused and neglected animals and takes practically any kind of animal that needs rescue. Right now they are home to dogs, cats, bunnies, goats and horses. They do not accept strays or surrendered animals. Operated locally by a volunteer staff, this non-profit organization accepts donations of time, money and supplies. Warthman said the bank recently donated a carload of food and supplies and is inviting customers to donate items as well. She said they will have a donation area inside the bank from now through June. “If they want to make a donation, no matter how big or small, they can just bring it into the bank and we’ll deliver it to the Humane Society. “Most of our employees are animal lovers and we feel compelled to help the Humane Society help these neglected and abused animals. It’s heartbreaking when you think about it. The Humane Society does a great job helping every animal they can but their resources are stretched thin. It’s expensive to keep them all fed and under roof and we just want to help,” Warthman said. Donations will be accepted during regular bank business hours through the end of June. Bank staff will regularly deliver donations to the Humane Society. To learn more about the Humane Society or to get involved, call them at 740.380.9109 or visit 36960 Hocking Dr., Logan. See below for a list of items the Humane Society needs at this time. In the age of self service and online travel booking sites, many Americans may not think to consult a travel agency for their next vacation. However, there’s one travel agent in Logan who says business is thriving and that her services are as needed today as ever. Great Escapes Travel owner Tracey Adams is a 33-year veteran of the business who says above-and-beyond customer service keeps clients coming back trip after trip. The demographic of her client base is broad, including people of all ages and backgrounds. She cites stories of trips she has planned for both young and old, families, couples, friends and singles as well as travelers from all backgrounds. She said that most of her clients are repeat customers, making it easier to recommend destinations and activities because she is familiar with their likes and dislikes. What are some reasons a traveler might find a travel agent like Adams helpful? The list is long, she says. One important reason relates to experience and knowledge. “Either by research or by first hand experience I am familiar with your destination. I’ve been doing this for 33 years so I can tell you what to see and what to avoid. I know when you’re actually getting a good deal and what you need to do before you leave,” she said. She went on to discuss how so many international travelers aren’t sure about how to get a passport, what inoculations they might need or what to pack. “I do all the research and I take care of you. I can look after you if a flight is cancelled and be there for you every step of the way. When considering her favorite destinations, she mentioned Disney because there are so many customizable options and because it is incredibly popular with people of all ages. Her absolute favorite trip though is Alaska. “It’s the most amazing place I’ve ever seen in my life. The people are so nice and the air is clean. The ice, the whales, the eagles are amazing in person,” she gushed. To learn more about Great Escapes Travel and how they can help you plan your next trip, call 740.385.1999 and follow them on Facebook. They are located at 60 N. Mulberry St. in Logan. See below for a few more pictures from Great Escapes Travel! Find Us At Saturday Events! This is a fantastic parade and one of our favorites! The parade winds through the streets of downtown, starting at the Hocking County Fairgrounds and ending at the Tractor Supply parking lot. The parade features many units including bands, businesses, local non-profits and regional event royalty. Best of all, it also marks the real beginning of the holidays in Logan with the arrival of Santa Claus! Parents are invited to bring their children to enjoy activities provided by the Logan Town Center before the parade, meet Santa and enjoy the lighting of the downtown lights. The staff of our Hocking Hills Banking Center will be passing out candy so be sure to wave! Who doesn’t like cookies? With the donation of either one dollar or one canned food item, participants will receive a bag and a map for an approximate one mile walk around downtown Pataskala, collecting a cookie from each of the nearly three dozen stops on the route. Along the route there are children’s activities, food, and live music and entertainment. The Friendly Bremen Banking Center is a proud supporter of this year’s event and we’ll be participating with our own cookies so be sure to come see us. Learn more at the Main Street Christmas – Pataskala Facebook page! Enjoy a good old fashioned holiday celebration in downtown McArthur. This free event, hosted by the Vinton County Chamber of Commerce, features free wagon rides, door prizes, kids crafts, music, chinese auction, a parade, Santa and more! There’s even a 5K earlier in the day! Stop by our bank to enter our drawing and for your child to put together our Christmas craft project! Learn more here.